Hershey, PA, February 11, 2016 (Newswire.com) – The importance of an accelerated roadmap for affordable special education solutions through technology was once again driven home at the Pennsylvania Department of Education Bureau of Special Education Annual Conference, where ColorsKit exhibited how the Early Education and Life Skills systems are changing the way special needs are managed from infancy through adolescence and beyond. 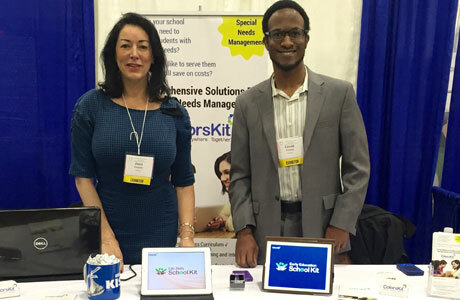 “This is one of the most awaited special education summits in the Northeast and we are thrilled to get this opportunity to present our programs to teachers, students and peers in Pennsylvania,” Janet said. “Big data is one of the main topics of discussion here and we can bring the technology necessary to work with big data in the classroom and at homes. This unique technological solution for special needs management revolutionizes where, when and how assessment and intervention are delivered. Call us for a personalized demo,” she added. The event at the Hershey Lodge and Convention Center had a stellar lineup of keynote speakers, including Timothy Odegard, Ph.D., Hasan Davis, J.D., and Maysoon Zayid. Laurie E. Cutting, Ph.D., Batya Elbaum, Ph.D., Joyce Epstein, Ph.D., Daniel Habib, John Hosp, Ph.D., Mindy Larson, Kent McIntosh, Ph.D., NCSP, and Robert Stephenson were among the other featured speakers. “For those who were unable to join us here today, please send an email to contact.ck@colorskit.com for a free demo of our assessment and intervention programs,” Gerald said. Notably, the Senior UI Designer from WebTeam Corporation had earlier made a plea to employers and the autism community from the Central Jersey region to check out TheSpectrumCareers.com, a job portal for the differently-abled.